Daylilies in Wellesley Hills (Posterized Photo), a photo by randubnick on Flickr. This image began with a photo that I took today in Wellesley Hills, MA. I had an appointment to keep, but I saw some beautiful day lilies outside the building, so I took a quick photo or two with my iPhone camera. The appointment couldn't have gone better; in fact, it was perfect. However, my photo was not! Tonight, when I got the image into my computer, I could see that the focus was soft, so I decided to open the image in Painter and posterize it. I liked the result, so I then used iPhoto to crop it to get this composition. I also used Painter to create a digital woodcut, which I will publish here tomorrow. Sunset on the Water (Posterized Photo), a photo by randubnick on Flickr. This image began with a photo that I took last night during a sunset walk at a local park. I liked the colors reflected in the water, so I took some pictures. Tonight I used Painter to posterize the image to heighten the colors and shapes, and the posterizing has the added benefit of making the houses less recognizable. 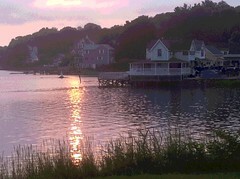 You see a lot of waterfront houses around here, and I really like the way they look. 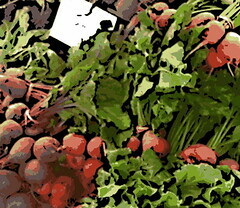 Farmer's Market Beets (Digital Woodcut), a photo by randubnick on Flickr. Yesterday I published a photograph that I took at Beverly's Farmers' Market of red and orange beets, posterized with my Painter software. Last night I also used Painter to create a digital woodcut from the same photo, and here it is. 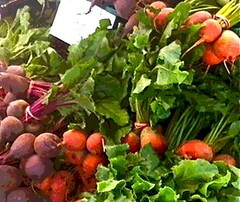 Farmer's Market Beets (Posterized Photo), a photo by randubnick on Flickr. This image began with a photo that I took today at the Farmers' Market here in Beverly, MA. It was a busy day, and I only had a few minutes to look around, but I saw the red and orange beets on display and took a quick picture with my iPhone camera. Later, I used Painter to posterize the image, and then cropped it in iPhoto to get this composition. I also created a digital woodcut, to be posted here tomorrow. Tropical Fish in Belfast (Posterized Photo), a photo by randubnick on Flickr. This image began with a photo that I took during my recent stay in Belfast, Northern Ireland, in the "Tropical Ravine", part of the botanical gardens at Queen's University. Finding images of tropical plants among my photos from Belfast might seem surprising, but actually this wasn't my first visit, so I already knew that you can see lots of beautiful plants on campus in the greenhouses, no matter what the weather. 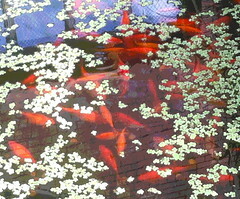 But still, it was surprising to suddenly see a pond full of bright orange fish! (I love this kind of surprise, especially on a trip.) I was interested in the way the brick wall and window were reflected in the water, so I took a picture. Tonight I used Painter to posterize the image, and then I cropped it to get this composition. 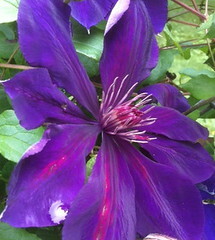 Close Look at Clematis, a photo by randubnick on Flickr. The clematis in my back yard has been opening up over the past few days, but it has been hard to find time to take photos, especially with the rainy weather. But I managed to get a few photos between storms. I love the colors and subtle patterns, so I got up close with my iPhone camera. Later, I did an even closer crop in iPhoto. Pink Roses, a photo by randubnick on Flickr. 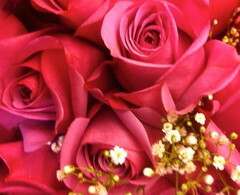 Today I bought a birthday bouquet of pink roses. I put the bouquet down on the counter for a minute, and the roses looked so good that I took a picture with my iPhone camera. Tonight I cropped the original photo to get this composition. 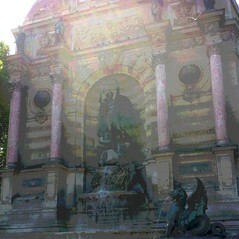 Fontaine Saint Michel (Posterized Photo), a photo by randubnick on Flickr. Yesterday's post was a photo that I took on my last day in Paris, La Fontaine Saint Michel. I took the photo not only because this Paris icon was a landmark for the Metro stop for the Latin Quarter, but because I loved the way the light was shining on the structure. Tonight I used Painter to posterize the photo to emphasize the play of light and dark. That's one of the best things about taking pictures of your travels: you can always go back for one last look. La Fontaine Saint-Michel, a photo by randubnick on Flickr. It was certainly hard to leave Portugal, but it was time to fly back to Paris for the last two days of the trip. We stayed at a hotel near the airport (to catch an early flight), but there was still time to take the train into Paris for one last day. This is the view near the Metro stop in the Latin Quarter, which is where most of that day was spent. I loved the way the light looked on the statue, so I took some pictures. This is the best of them. I did a tiny bit of retouching of some marks on the statue, but apart from that, this is just as it came out of the camera. So the end of the trip came too fast, but I have many, many photos and lots of great memories. Solar do Vinho do Porto (Digitally Edited), a photo by randubnick on Flickr. I have so many wonderful memories of my trip to Portugal, and this is one of them: looking out at the Douro River from the rose garden at the Solar do Vinho do Porto. If you want to sit in the garden, you are required to drink port. I sipped a port cocktail with orange juice, and mint, while I watched the late afternoon light. Of course, I took pictures, too. The original version of this photograph came out of the camera in pretty good shape. I just adjusted the exposure a little bit, and used some cut-and-paste to get rid of some distractions in the foreground. Apart from that, the photo has not been changed. It was really this beautiful there. Stairway in Porto, a photo by randubnick on Flickr. Here is one of the many, many pictures I took during my short visit to Portugal. I love the old buildings and alleys of Porto in the old area near the river. I saw stairways that serve as streets (or alleys), like the ones I had seen in Lisbon's Alfama area during one of my earlier visits to Portugal. 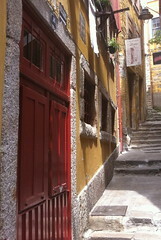 As we walked around Porto, I noticed the red door and the ochre wall, so I took a picture. Tonight I edited the original version in Painter, using some cut-and-paste and digital airbrush to eliminate some distractions. 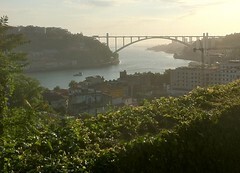 Then I did a final crop in iPhoto and here it is, a little glimpse of Porto. Daddy's Girl, a photo by randubnick on Flickr. Well, it is Father's Day, so of course my dad has been on my mind. This image began with one of my favorite family photos, taken by my uncle, Ike Fitterman. (My uncle was a professional photographer who worked under the name Jay Phillips, and he took many wonderful pictures of our family.) Tonight I used my iPhone camera to snap a quick picture of the original photo that is hanging on my wall. Once I got the image into my computer, I cropped it to get this composition, and then used color overlays and then posterized it, experimenting until I got the level of posterized effect that I wanted. I got the image back into iPhoto and did one more crop to get this final image, which is very much a collaboration with my Uncle Ike. 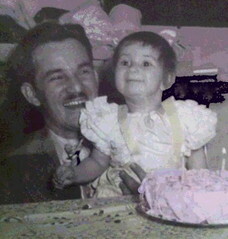 And working on this image gives me a way to spend a little time with my dad on Father's Day, because I am still my Daddy's girl. Ponte de Dom Luis (Posterized Photo), a photo by randubnick on Flickr. This image began with one of the many photos that I took during a boat ride in Porto. It was wonderful, start to finish, and a beautiful way to see the city. 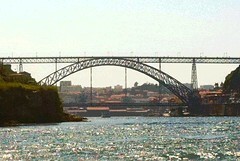 The tour boat goes under six bridges of Porto. This is a view of the most famous of the bridges, the Ponte Dom Luis. Tonight I cropped this image out of one of my photos, and used Painter to posterize it. Evening in Porto (Posterized Photo), a photo by randubnick on Flickr. I flew from Paris to Porto to spend a few days. The visit was too short but it was wonderful to be there. This is the view at sundown the evening I arrived, seen from a restaurant near the Arrabida Bridge. The scene was spectacular, so I took some pictures. Tonight I used Painter to do some cut-and-paste to conceal some highway lamps in the original photo. Then I posterized the image, and cropped it to get this composition. This image began as a photo that I took at the Galeries Lafayette during the third day of my recent visit to Paris. Although this is a major shopping destination, I wasn't there to shop. (There was no room in my suitcase anyway.) But I did want to see the famous gallery and windows that I remembered from my college art history class. I was not disappointed! Tonight I used Painter to create this digital woodcut from one of my photos. Looking Up at Montmartre (Posterized), a photo by randubnick on Flickr. This image began with a photo that I took on the second day in Paris. The hotel was near the Gare du Nord. 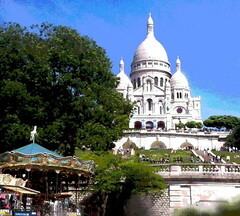 I looked at the map and saw that Montmartre was not too far, so I decided to walk there. The basilica looks just like all the iconic pictures of it, but I was surprised to see so many tourists, souvenir stands, and the carousel! I liked the juxtaposition of the merry-go-round with the rest of the scene, so I decided to take a picture despite the crowds. The original version of this photo had lots of tourists in the foreground, but I opened the image in Painter and used some cropping, some cut-and-paste, and some digital airbrush to get a somewhat quieter scene. Then I posterized the result, and cropped one more time to get this composition. 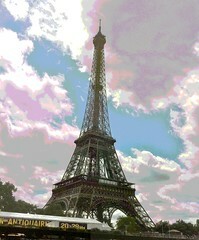 Eiffel Tower (Posterized Photo), a photo by randubnick on Flickr. This image began with a photo that I took a few weeks ago, during a little tour boat ride down the Seine. The boat ride was a relaxing way to start the visit to Paris and I took lots of photographs. Taking pictures of the Eiffel Tower seems like such a cliche, but I took pictures of it anyway, lots of them. And it is actually kind of tricky to find a composition that works. This composition was one of the best of the lot. But I wanted to punch it up a bit, so tonight I used Painter to add pink overlays to the sky and the tower, and then posterized the image, and here it is, a little daydream from my trip to Paris. First View of France Stroke-by-Stroke Video a video by randubnick on Flickr. Yesterday I posted a digital sketch that I drew as the Eurostar train emerged from the tunnel in France. I didn't have a chance to recharge my iPhone so I couldn't take a picture of the scene. 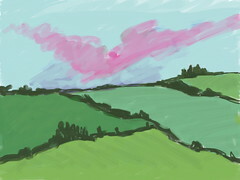 So I used the Brushes app on my iPad to draw the sun setting over the fields of France. This is the stroke-by-stroke video captured by Brushes as I drew. The little video seemed to stall out before completion when I downloaded it, so I used iMovie to add a still of the final drawing. First View of France (Digital Sketch), a photo by randubnick on Flickr. This is a digital sketch that I made on my iPad with Brushes. I was on the Eurostar train from London to Paris, and when the train emerged from the tunnel, I saw a beautiful view of France as the sun was going down. At that point, I had no functioning camera. During the ride from Glasgow to London and the mad rush to change trains in London, there was no time to charge my iPhone. So I got out my iPad and sketched the scene instead. Darlington Stroke-by-Stroke Video a video by randubnick on Flickr. Yesterday I posted a digital sketch that I made on my iPad with the Brushes app, a view of Darlington, England, seen from the train. The Brushes App captures a stroke-by-stroke video as you draw, so tonight I am posting the stroke-by-stroke video of my sketch of Darlington. The drawing is a little rough, but keep in mind that I was on a moving train. I used iMovie to create the final video, and added a still shot at the end. Darlington (Digital Sketch), a photo by randubnick on Flickr. During the train ride from Glasgow to London, I made this digital sketch on my iPad with the Brushes app. When the train stopped at Darlington, I had a view looking down on the town from a railroad bridge. At that point, my iPhone camera had low battery, so instead of taking a photo, I pulled out my iPad and started to sketch. I kept going long after the train left the Darlington station. 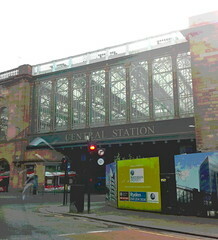 Glasgow Central Station (Posterized Photo), a photo by randubnick on Flickr. After spending the night in a hotel two blocks from Glasgow's train station, we turned in our rental car early the next morning and caught a ride back to our hotel from the rental car folks. I took this picture of the train station as the driver was stopped a red light. A few minutes later, he dropped us off at the hotel, where we checked out, collected our bags, and returned to this train station to catch the train to London. From there we would transfer to the Eurostar train to Paris. I took this photo partly because I was excited about the train trip and Paris, but also because I love train stations. In this photo you can see the beautiful 19th century ceiling and windows of Central Station, juxtaposed with modern traffic lights and advertisements. You can also catch some reflections on the car window. Today I used iPhoto to edit the image, and also used Painter to posterize it, trying to heighten the colors to match the excitement I felt that day. Along the Coast in Scotland, a photo by randubnick on Flickr. 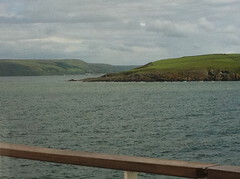 The return trip to Scotland from Belfast was on a vehicle ferry (Stena line) to Stranraer. The plan was to drive to Glasgow to spend the night, so from Stranraer we drove north on the A77 towards Ayr. (I was the navigator on this trip, so I remember the road number, but I did check on Google tonight to be sure.) I had been on that stretch of road before during a previous trip, so I knew that it would be beautiful, and I wasn't disappointed. 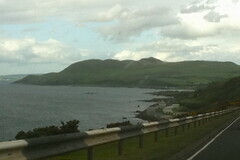 It is a coast road with amazing views of the ocean and surprises at every turn. It was still breathtaking even though I had seen it before. Even though the light was fading, I took lots of pictures from the passenger side of the car. This is one of the best of the set. Once I got home, I edited the original version in iPhoto to get this composition. Toward Scotland, a photo by randubnick on Flickr. I took this photograph from the Stena line ferry, heading back to Stranraer, Scotland. I was taking pictures with my iPhone camera as the boat approached Scotland. The light was beautiful and the composition kept changing as the boat moved. This is one of the best photos that I took that day. Belfast Chimneys (Digital Woodcut), a photo by randubnick on Flickr. 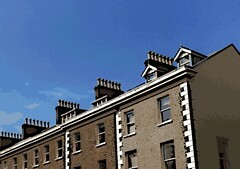 I am a fan of the chimneys in Belfast. I like the repeated patterns they create on the rooftops. Even though the buildings in this photo are owned by Queens University and are now used as offices, they still look like many of the rowhouses there. Tonight I cropped this image from one of the photos I took during my recent visit to Northern Ireland, and then used Painter to turn it into a digital woodcut. Approaching Belfast, a photo by randubnick on Flickr. Today I spent some time editing more photos from my recent travels, and the batch I worked on today included the drive north from England to Stranraer, Scotland, to catch the vehicle ferry to Belfast. Although many of the photos I edited today were more colorful or more appealing, I think this photo is the strongest of the bunch, so I am posting it here. 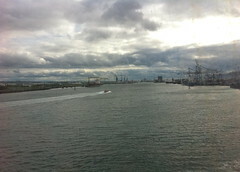 I took this photograph from the Stena Line Ferry as the boat was approaching Belfast. I like the luminosity of the water, the cloud formations, and the strong diagonal created by the small boat in the foreground. I used iPhoto to straighten and crop just a bit, adjust the exposure, and retouch a couple of marks caused by streaks on the window of the boat.. 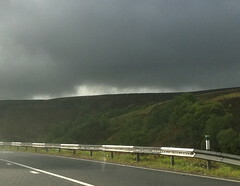 This is a photograph that I took in England during my trip, on the road from Windmere to Penrith in the Lake District. The owner of the bed and breakfast in Windmere suggested the scenic drive, and it was as advertised: beautiful views, a winding road, with fog and rain adding atmosphere. I was in the passenger seat and took lots of pictures. Now I am back at home, and this morning I edited this set of photos, cropping out the interior of the car. The original photos are fun, and convey a sense of the twists and turns of the journey, and I plan to keep some of them in the album for friends to see. 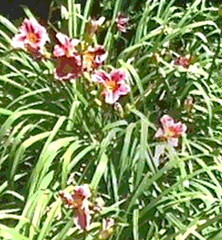 But to get the landscapes I wanted, I used iPhoto to straighten and crop, and where necessary, to adjust the exposure. I am still editing the photos that I took on my recent trip so that I can share them with friends and family. I also hope to make art with some of the photos. This morning I was working on the photos that I took in the Lake District in England. 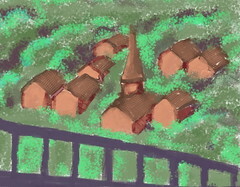 This image began with one of those photos, the view from the window of a bed and breakfast just outside Windmere. This morning I decided to turn this into a digital woodcut using Painter. I wanted more color in the image, so I added some color overlays as well. My recent short stay in England included a visit to York, which is a fascinating mix of old and new, quaint buildings and Starbucks, narrow streets filled with parked cars. I had a lot of fun and took lots of pictures of the tourist-filled streets. I loved the patterns in the half-timbered houses, but it was hard to get a photo that didn't include traffic lights and neon signs. Tonight I opened the original version of this photo in Painter. First I used some cut and paste to cover up a car parked in front of the building. Then I used some digital airbrush to cover up electric wires in the sky and in front of the building. Then I posterized the image and turned it into a digital woodcut, using a reverse selection to leave the sky unchanged. Then I transferred the result back to iPhoto for a final straightening and crop, and here it is. Today I transferred the videos and photos from my recent trip from my iPhone into iPhoto, and started editing. I am going to crop and label and edit my travel photos to make albums to share with friends and family (through e-mail, Facebook, or MobileMe gallery). But don't worry: I don't plan to post all my travel photos on this site. As I edit, I am also looking for photos that I took with art in mind, and those are the kind of photos I plan to post here. I took this photograph shortly after arrival in the UK. The flight landed in Manchester, and the weather was very overcast, cold, and rainy. We picked up the rental car and headed toward Sheffield. I was expecting the area to be very industrialized, so I was surprised to see the green hillsides. It was still cloudy and raining, but the sun began to come out just a bit. I liked the light, so I took some pictures. (I was in the passenger seat of a moving car: this time on the opposite side of the road!) Tonight I used iPhoto to adjust the exposure just a bit and to crop this image out of the original photo, trimming out the interior of the car. The sunshine through the rain made me feel optimistic about the trip. Turns out I was right about that.